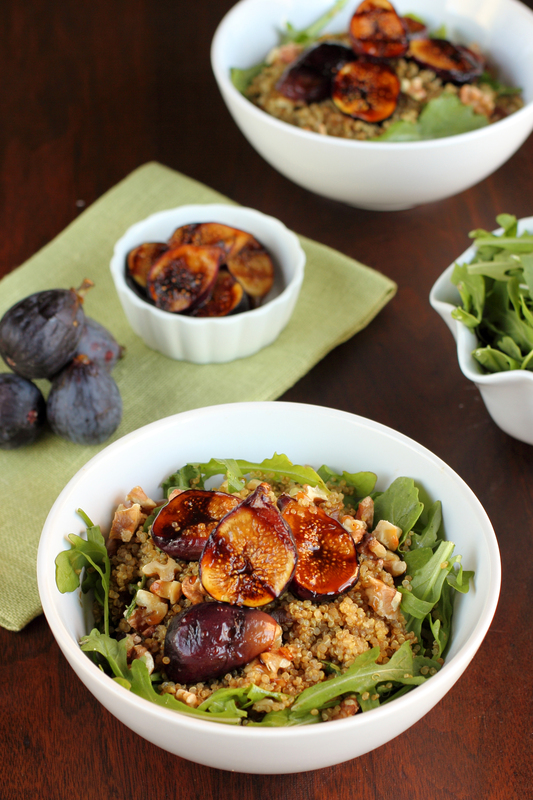 This Balsamic Honey Grilled Fig Quinoa Bowl is a light lunch that leaves you feeling full. The balsamic honey sauce ties all of the components together in a warm, summery meal that doesn’t involve turning on the oven. Grilling the figs caramelizes the balsamic honey to bring out figs’ natural, mellow sweetness. 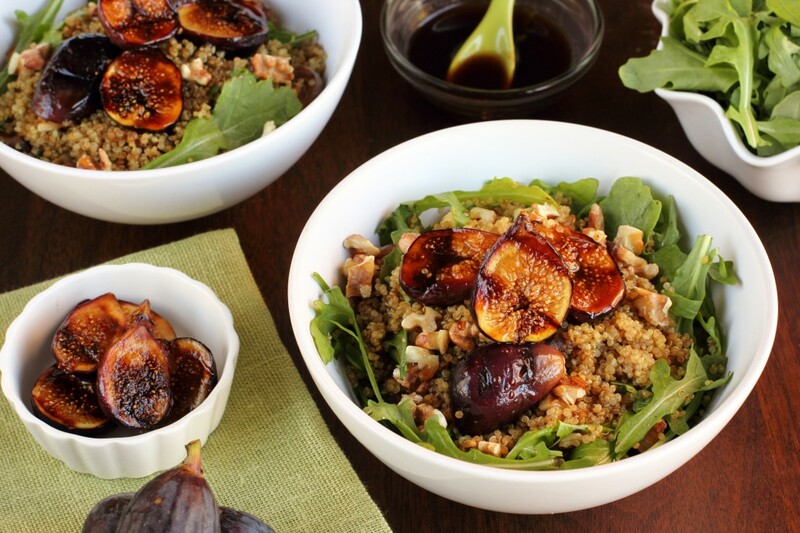 Crunchy walnuts, sharp arugula, and tender grilled figs combine with the quinoa for a delightful mixture of textures and tastes. Rinse quinoa using a fine mesh sieve and drain well. In a small pot, add the rinsed quinoa, spices, and vegetable broth. Cover the pot with a lid and simmer over medium-low heat for 20 minutes. Remove from heat and fluff with a fork.Cover loosely with lid and set aside. In a saucepan over medium-low heat, whisk together balsamic vinegar, honey, and olive oil until thickened and the mixture is syrupy (5-7 minutes). Preheat your grill (indoor or outdoor is fine—a grill pan was used for this recipe). Gently wash the figs and pat dry. Cut the figs in half from the stem down (the stem is quite hard to cut through, so you can cut just to the side of the stem. You have the option of cutting off the stem, but the figs will hold their shape better if you leave the stem intact. Dip the figs into the balsamic honey mixture until well coated. Place them face down on the grill until you get charred marks from where the honey caramelizes, about 3-4 minutes. Flip and let them cook on their backs for another minute or two. Transfer to a plate and continue cooking until all figs are grilled. Set aside. 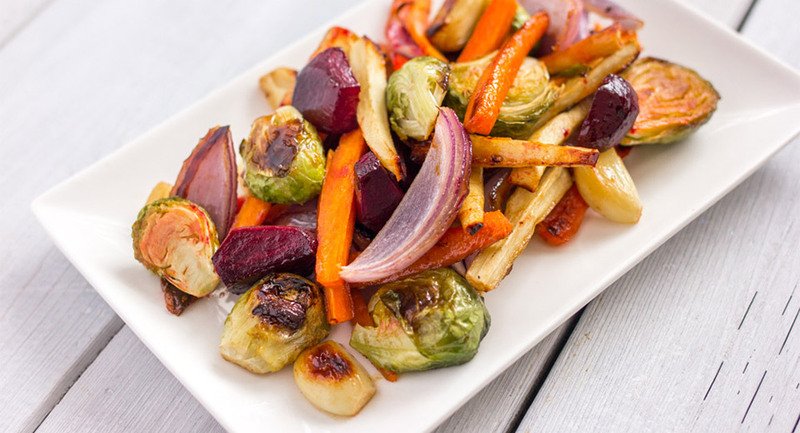 Slice shallots, and gently sauté in 1/4 balsamic honey sauce until softened and cooked through. Add cooked shallots and arugula to cooked quinoa and stir well. 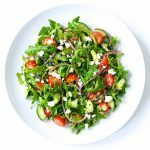 To assemble the quinoa bowls, divide arugula, quinoa and shallot mixture between four bowls. Garnish with 4-5 fig halves and a generous sprinkle of chopped walnuts. Drizzle with the balsamic honey dressing and serve. 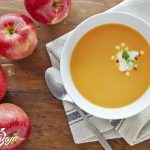 This recipe was developed by Lisa Le, the creator behind The Viet Vegan, a vegan and ethical lifestyle food blog and Youtube channel. 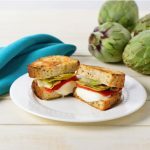 She documents her plant-based life; sharing about delicious food, her eczema-healing journey, and mental health. 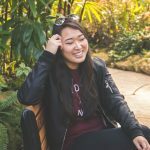 Lisa always aims to advocate for veganism with an intersectional approach: creating vegan content with an environmentally-conscious, LGBTQ+ inclusive, self-critical and feminist lens.